Know all ye by these presents that Coleen Rowley is hereby awarded The Corner-Brightener Candlestick*, presented by Sam Adams Associates for Integrity in Intelligence. Knowing that truth ignored is truth suppressed, that error tolerated is error magnified, she endured the scorn of her peers and the hostility of her superiors to break the bureaucratic bonds and boundaries of her agency and tell truth to power at a moment of grave peril to the United States of America. Thanks to her perception, wisdom and courage, our country is better prepared to grapple with that peril and bring it to ground. She risked her livelihood that our lives might be safeguarded. Presented this 10th day of January, 2003, at the Seat of Government (well, very near it) by admirers of the Sam Adams tradition. *Commercial value certified at less than $20, candle included. Experience has raised valid concerns about unity and global democracy as the formula to prevent war and strife. (By Diana Johnstone and Coleen Rowley, published October , 2015, in the Minneapolis Star Tribune. Organizers and participants in the upcoming “Creating a Workable World” conference (Friday and Saturday at the University of Minnesota) are undoubtedly sincere. No one wants to live in an unworkable world. The sponsoring World Federalist Movement has historically exercised a strong attraction on progressives, appealing to their generous sentiments and wish for world peace. However, such a grand, overarching ideal as world federalism or global democracy must be evaluated in light of current circumstances and its track record. At the end of World War II, it was widely believed that nationalism was the main cause of the horrors that had just devastated much of the world. It was easy to imagine that abolishing nation states would be a step toward ending wars by removing their cause. This sentiment was particularly strong in Western Europe, forming the ideological foundation of the movement that led to European integration, now embodied in the European Union. In that same period, there was a historic movement going in the opposite direction: the national liberation movements in various colonized countries of the Third World. The political drive for national liberation from European powers — Britain, France, the Netherlands — contributed to establishing national sovereignty as the foundation of world peace, by outlawing aggression. Newly liberated Third World countries felt protected by the principle of national sovereignty, seeing it as essential to independence and even to survival. But today, 70 years after the end of World War II, experience has provided lessons in the practice of these two contrary ideals: supranational governance and national sovereignty. Not surprisingly, the official voices of the hegemonic world power and its allies tend to cite internal conflicts, especially in weaker Third World countries, as proof that national sovereignty must be violated in order to defend “human rights” and bring democracy. The danger from “genocide” has even become an official U.S.-NATO pretext for advocating and launching military intervention. With disastrous results. We fear that opposing arguments in favor of national sovereignty will probably not be discussed much during this conference. And yet, the European Union has served as an experimental laboratory testing what happens when a large and growing number (now 28) of sovereign states turns over a major part of their rights to supranational governance. Unified institutionally, the weaker members find themselves dominated by the powerful. Despite decades of speeches proclaiming that “we are all Europeans,” when it comes to the crunch, people revert radically to their national identity. Germans resent Greeks for being debtors; Greeks resent Germans for keeping them in debt. All the more so in that there is no way out. Elections are increasingly meaningless within the member states, because major economic decisions are taken essentially in Brussels, by the E.U. institutions. This is causing increasing disillusionment and depoliticization in Europe. Europeans take virtually no interest in the European Parliament. They do not feel represented by it, and indeed they are not. Democracy works best in small circumscriptions: Greek city states, Iceland, villages. The bigger it gets, the less “democratic” it can be. Half a century ago, the functioning ideal was to bring eternal peace to Europe through unity. Today, that institutional unity is creating new divisions and hostility. To put it simply, experience is in the process of killing the ideal and showing why “worldwide parliamentary democracy” may bring more harm than good, at least in the real world as it exists today and will for some time to come. Diana Johnstone, a Paris-based commentator, is author of “Fools’ Crusade: Yugoslavia, NATO, and Western Delusions” and “Queen of Chaos: The Misadventures of Hillary Clinton.” Coleen Rowley is a retired FBI agent and former legal counsel. Frustrated investigators might have chosen to leak information that their superiors bottled up, perhaps averting the terrorism attacks. The organization has drawn both high praise and searing criticism for its mission of publishing leaked documents without revealing their source, but we suspect the world hasn’t yet fully seen its potential. Let us explain. One of us, Coleen Rowley, was a special agent/legal counsel at the FBI’s Minneapolis division and worked closely with those who arrested would-be terrorist Zacarias Moussaoui on an immigration violation less than a month before the World Trade Center was destroyed. Following up on a tip from flight school instructors who had become suspicious of the French Moroccan who claimed to want to fly a jet as an “ego boost,” Special Agent Harry Samit and an INS colleague had detained Moussaoui. A foreign intelligence service promptly reported that he had connections with a foreign terrorist group, but FBI officials in Washington inexplicably turned down Samit’s request for authority to search Moussaoui’s laptop computer and personal effects. WikiLeaks might have provided a pressure valve for those agents who were terribly worried about what might happen and frustrated by their superiors’ seeming indifference. They were indeed stuck in a perplexing, no-win ethical dilemma as time ticked away. Their bosses issued continual warnings against “talking to the media” and frowned on whistle-blowing, yet the agents felt a strong need to protect the public. The other one of us writing this piece, Federal Air Marshal Bogdan Dzakovic, once co-led the Federal Aviation Administration’s Red Team to probe for vulnerabilities in airport security. He also has a story of how warnings were ignored in the run-up to Sept. 11. In repeated tests of security, his team found weaknesses nine out of 10 times that would make it possible for hijackers to smuggle weapons aboard and seize control of airplanes. But the team’s reports were ignored and suppressed, and the team was shut down entirely after 9/11. The commission included none of Dzakovic’s testimony in its report. Decisions to speak out inside or outside one’s chain of command — let alone to be seen as a whistle-blower or leaker of information — is fraught with ethical and legal questions and can never be undertaken lightly. But there are times when it must be considered. Official channels for whistle-blower protections have long proved illusory. In the past, some government employees have gone to the media, but that can’t be done fully anonymously, and it also puts reporters at risk of being sent to jail for refusing to reveal their sources. For all of these reasons, WikiLeaks provides a crucial safety valve. Coleen Rowley, a FBI special agent for more than 20 years, was legal counsel to the FBI field office in Minneapolis from 1990 to 2003. Bogdan Dzakovic was a special agent for the FAA’s security division. He filed a formal whistle-blower disclosure against the FAA for ignoring the vulnerabilities documented by the Red Team. For the past nine years he has been relegated to entry-level staff work for the Transportation Security Administration. 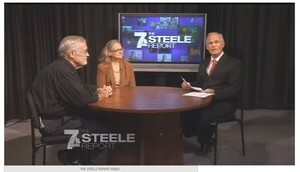 FBI Whistleblower Coleen Rowley and Former CIA Analyst Ray McGovern sit down with news analyst, Ron Steele to present specific questions individuals should ask presidential candidates. VFP Iowa Chapters sponsored the Rowley/McGovern speaking tour in September. The tour sought to raise the level of Iowans understanding of current national security issues. The tour also focused on specific issues that Iowa caucus-goers may raise at the February caucuses. Edward Snowden warned an Iowa City audience Monday of the dangers of the public becoming more accountable to the government at a time when the government is becoming less accountable to the public. Snowden, the former intelligence worker who made headlines worldwide when he leaked classified information about the National Security Agency’s surveillance of U.S. citizens in 2013, has been living in Russia under asylum since fleeing the U.S. He received a standing ovation by many in the audience at the packed theater during an event hosted by the University of Iowa’s Lecture Committee. Snowden was a last-minute addition — his appearance was announced Friday — to the event, which featured talks by former CIA analyst Ray McGovern and FBI whistle-blower Coleen Rowley. The former NSA systems analyst spoke at length about the dangers of a government using electronic data to monitor its citizens unchecked.